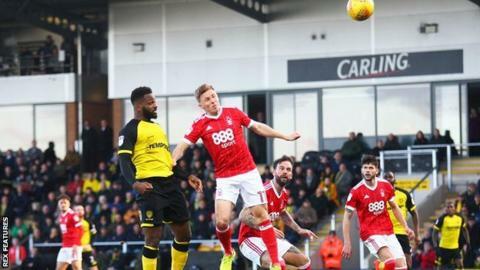 Burton Albion's winless home run was extended to 12 matches as they failed to break down 10-man Nottingham Forest. The Brewers were given a golden chance after half an hour when Forest's Eric Lichaj was shown a straight red card for a wild lunge on Martin Samuelsen. Burton went on to dominate, with Darren Bent heading just over and Samuelsen's long-range strike forcing a low save from Costel Pantilimon. But Nigel Clough's side could not turn their pressure into a precious winner. Forest boss Aitor Karanka promised changes following their third straight defeat by Hull City, and he made six of them, including debuts for centre-back Tomas Figueiredo and midfielder Ben Watson, who was made captain. And the visitors started well, Joe Lolley linking up well with Matty Cash and forcing a save from Stephen Bywater with a crisp shot. But that was as good as it got for the visitors as Burton grew in confidence after a shaky opening, especially after Lichaj's dismissal. Clear chances remained at a premium from two out-of-form sides, with Samuelsen volleying straight at Pantilimon and Burton team-mates Hope Akpan and Lucas Akins both failing to find a decisive goal. Burton, who have not won at the Pirelli Stadium since 21 September, remain bottom on goal difference from Sunderland, while Forest - who have won just once in their past 11 league outings - stay 17th. "It's a highly unusual situation for us to have the majority of the possession and dominate the game the way we did. "Then you need a little bit of quality, a cross or a finish or something, and that's what we have been lacking all season. "We had four or five very good situations today and we just needed one to go in. But there were good performances and play, and if you compare it to how we were against Reading then it looks a completely different team." "It's been an amazing performance for me; I'm really proud of the players. It's been difficult. "Everybody needed a performance today. I don't think that was a red card. It's not our day to complain. It's our day to look forward, though, because I'm proud. "[Ben] Watson is the player who is going to wear the armband, but I want five or six captains in the changing room." Match ends, Burton Albion 0, Nottingham Forest 0. Second Half ends, Burton Albion 0, Nottingham Forest 0. Attempt blocked. Luke Murphy (Burton Albion) right footed shot from outside the box is blocked. Assisted by Jacob Davenport. Attempt saved. Lucas Akins (Burton Albion) right footed shot from the left side of the box is saved in the centre of the goal. Assisted by Lloyd Dyer. Kieran Dowell (Nottingham Forest) is shown the yellow card. Offside, Nottingham Forest. Ben Osborn tries a through ball, but Kieran Dowell is caught offside. Substitution, Burton Albion. Luke Murphy replaces Hope Akpan. Jack Colback (Nottingham Forest) is shown the yellow card. Jacob Davenport (Burton Albion) wins a free kick in the defensive half. Foul by Ben Watson (Nottingham Forest). Substitution, Nottingham Forest. Kieran Dowell replaces Lee Tomlin. Offside, Burton Albion. Joe Sbarra tries a through ball, but Lucas Akins is caught offside. Attempt missed. Tendayi Darikwa (Nottingham Forest) right footed shot from outside the box is close, but misses to the left. Attempt missed. Kyle McFadzean (Burton Albion) left footed shot from outside the box is high and wide to the left. Attempt blocked. Kyle McFadzean (Burton Albion) right footed shot from outside the box is blocked. Assisted by Jacob Davenport. Corner, Burton Albion. Conceded by Daniel Fox. Attempt blocked. Darren Bent (Burton Albion) left footed shot from the centre of the box is blocked. Assisted by Joe Sbarra with a cross. Corner, Burton Albion. Conceded by Jack Colback. Attempt saved. Martin Samuelsen (Burton Albion) left footed shot from outside the box is saved in the bottom right corner. Assisted by Lucas Akins. Substitution, Burton Albion. Liam Boyce replaces Jamie Allen. Attempt blocked. Jamie Allen (Burton Albion) right footed shot from outside the box is blocked. Assisted by Kyle McFadzean. Corner, Burton Albion. Conceded by Ben Watson. Tom Naylor (Burton Albion) wins a free kick in the defensive half. Foul by Lee Tomlin (Nottingham Forest). Foul by Darren Bent (Burton Albion). Costel Pantilimon (Nottingham Forest) wins a free kick in the defensive half. Substitution, Nottingham Forest. Daryl Murphy replaces Ben Brereton. Corner, Nottingham Forest. Conceded by Kyle McFadzean. Substitution, Burton Albion. Joe Sbarra replaces John Brayford because of an injury. Delay in match John Brayford (Burton Albion) because of an injury. Attempt blocked. Hope Akpan (Burton Albion) right footed shot from outside the box is blocked. Attempt saved. Jacob Davenport (Burton Albion) right footed shot from outside the box is saved in the centre of the goal. Assisted by Martin Samuelsen. Corner, Nottingham Forest. Conceded by Lucas Akins. Attempt blocked. Ben Brereton (Nottingham Forest) right footed shot from the right side of the box is blocked. Assisted by Matthew Cash. Attempt missed. Darren Bent (Burton Albion) header from the centre of the box is just a bit too high. Assisted by Martin Samuelsen. Attempt missed. Hope Akpan (Burton Albion) right footed shot from outside the box is just a bit too high. Assisted by Lucas Akins with a cross. Second Half begins Burton Albion 0, Nottingham Forest 0. First Half ends, Burton Albion 0, Nottingham Forest 0. Attempt missed. Hope Akpan (Burton Albion) header from the centre of the box is close, but misses to the left. Assisted by Martin Samuelsen.